Disclosure: We received a copy of the Blu-ray for review and are being supplied additional copies for a giveaway. Opinions are our own. Star Wars Rebels has to be one of my all time Star Wars stories. I have been with it from the very beginning watching the adventures of the Ghost crew and the spark of the Rebellion. So much has happened in this series and I am sad that it is over but the final episodes are incredible and so meaningful to the Star Wars experience. This was also a series that I would watch with my daughter, Eva. I loved that there were great female characters like Sabine and Hera and later on Eva was introduced to Ahsoka Tano. Then she was literally introduced to Ahsoka while we were on the Disney Dream. Yes, we met the delightful Ashley Eckstein. This made my excitement over the show even stronger. Eva was also impressed. I watched Season 4 when it was on Disney XD and I loved it. So many amazing things happened in the season. I love these characters, they are some of the best characters in all of Star Wars in my opinion. So, I watched many of the extras in the Blu-ray. Ghosts of Legend was phenomenal where we learned about crew of the Ghost, or rather the family unit. The family is so important in this show, we learn more about the evolution of how this family came to become stronger. The bonus featurette Force of Rebellion offered incredible insight into how The Force played its part in the show. Then we also have a featurette all about the composing of the music for the show. There are so many great extras on this Blu-ray. 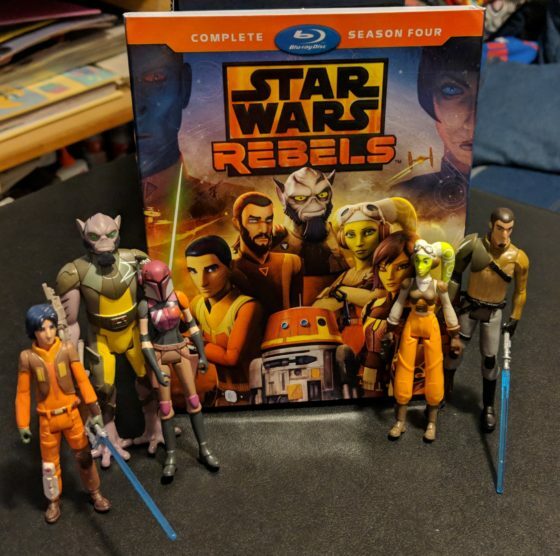 I have two copies of the Star Wars Rebels Season 4 on Blu-ray to give away. Enter through the Rafflecopter Widget below. My favorite Star Wars Rebels Character is Sabine Wren. Chopper is my favorite Star Wars Rebels charachter. This show is a lot of fun. I hope that I win. My favorite character is Ezra Bridger. Sabine is my favorite character. I like Ezra the best. I gotta love my man, Rex from the old Clone War days! Sabine is our favorite. Thank you. Would love to win.